Showing items in category Niger Coast , sorted by newest listed first. NIGER COAST - 1897 2d lake fine mint with REVERSED WATERMARK. SG 68x. 1897 2d lake in fine mint condition showing ther edge two bars of the watermark plate and with variety WATERMARK REVERSED. SG 68x. NIGER COAST - 1895 1d vermilion PSC to USA (scarce) used at BENIN RIVER. H&G 3. 1895 1d vermilion on buff postal stationery postcard of GB overprinted NIGER COAST PROTECTORATE addressed to USA (scarce) and cancelled by s/r BENIN RIVER cds dated DE.11.00. Central fold but a scarce destination from Niger Coast. H&G 3. NIGER COAST - 1893 1/2d vermilion on 2 1/2d surcharge adhesive used at OPOBO RIVER. SG 17. 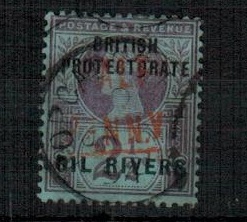 1893 1/2d vermilion on 2 1/2d adhesive cancelled by OPOBO RIVER cds dated JA.3.94 and showing the type 5 handstamp with stop after N. SG 17. NIGER COAST - 1898 2 1/2d rate ROYAL NIGER COMPANY/BURUTU cover to UK. 1898 (NOV.15.) cover addressed to UK bearing GB 2 1/2d adhesive tied by fine violet boxed THE ROYAL NIGER COMPANY/CHARTERED & LIMITED/POST OFFICE/BURUTU h/s. SG Z 59. 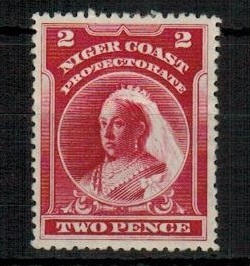 NIGER COAST - 1892 range of Fournier overprints and surcharges on piece. 1892 range of FOURNIER overprint and surcharges printed in black on cream paper affixed to part of the original Fournier handbook showing BRITISH/PROTECTORATE/OIL RIVERS, one shilling, two types of the HALF PENNY plus 5/-, 10/- and 20/- handstamps. 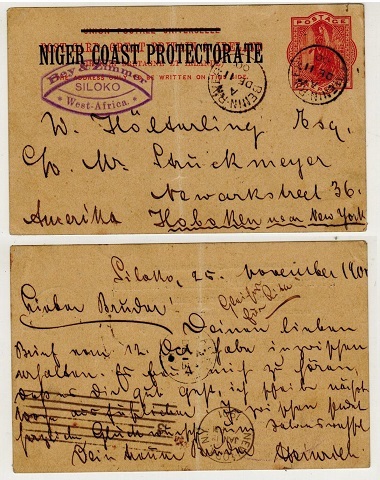 NIGER COAST - 1895 1d vermilion PSC to Switzerland used at FORCADOS RIVER. H&G 3. 1895 1d vermilion on buff postal stationery postcard of GB overprinted NIGER COAST PROTECTORATE addressed to Switzerland and cancelled by light s/r FORCADOS RIVER cds dated JU.19.02. H&G 3. NIGER COAST - 1895 1d vermilion PSC unused. H&G 3. 1895 1d vermilion on buff postal stationery postcard of GB overprinted NIGER COAST PROTECTORATE in fine unused condition. H&G 3. 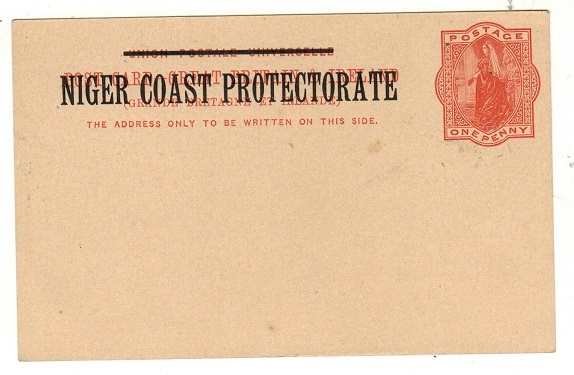 NIGER COAST - 1900 1d rate cover to UK used at BONNY RIVER. 1900 (DE.16.) 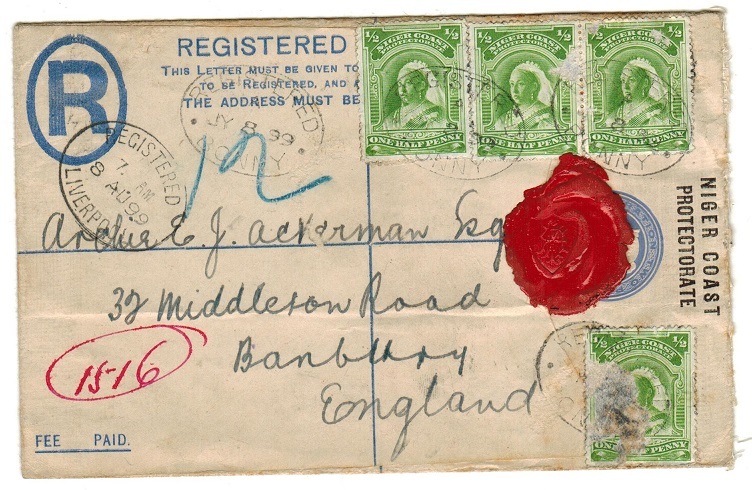 cover addressed to UK bearing 1d adhesive cancelled by s/r BONNY RIVER cds with 'A' coding. 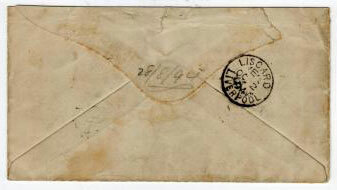 NIGER COAST - 1892 1/2d brown PSC uprated to UK cancelled by BONNY parcel cancel. H&G 1. 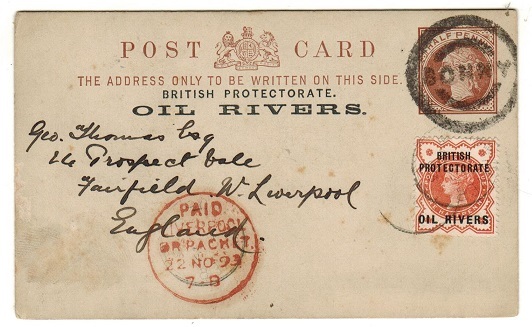 1892 1/2d brown on cream postal stationery postcard of GB overprinted BRITISH PROTECTORATE/ OIL RIVERS addressed to UK (no message) cancelled by rare d/r BONNY rubber cancel (Proud PP1) with 1/2d adhesive added and cancelled by BONNY RIVER cds dated OCT.19.93 with red PAID/ LIVERPOOL/BR.PACKET strike applied. 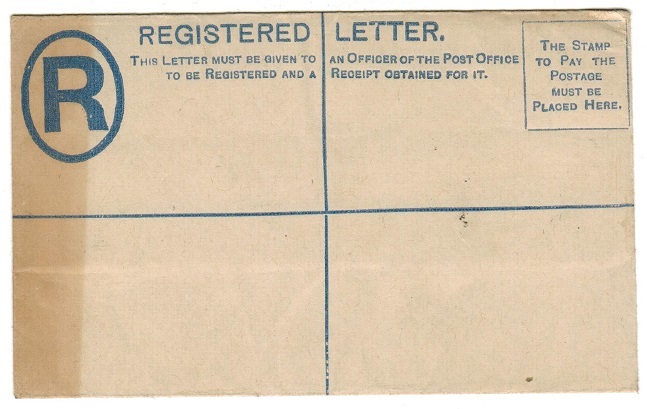 A scarce parcel cancel used on this stationery card. H&G 1. NIGER COAST - 1900 1d rate cover to UK used at FORCADOS RIVER. 1900 (OC.5.) 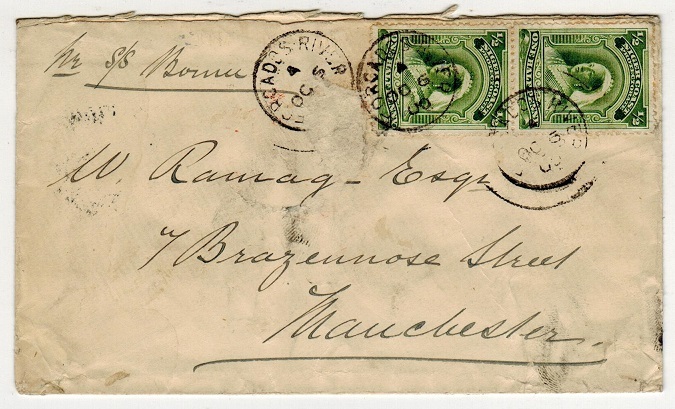 cover addressed to UK bearing 1/2d green pair tied by s/r FORCADOS RIVER cds. Small thin to left of stamp on surface. MANCHESTER arrival b/s. NIGER COAST - 1897 2d ultramarine RPSE (size G) unused. H&G 5. 1897 2d ultramarine on cream registered postal stationery envelope (size G) unused. Just a hint of ageing and small adherence under flap from glue. H&G 5. NIGER COAST - 1892 2d ultramarine on cream RPSE (size F) unused. H&G 2. 1892 2d ultramarine on cream registered postal stationery envelope of GB overprinted BRITISH PROTECTORATE/OIL RIVERS in black (size F) in fine unused condition with 2d/£5 to 6d/£25 compensation table on reverse. Only 504 printed. H&G 2. NIGER COAST - 1899 POST OFFICE/BURUTU h/s cover to UK. 1899 (JUN.12.) 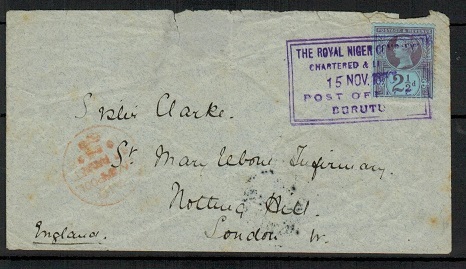 cover addressed to UK bearing GB 'QV' 1d lilac adhesive (SG Z57) tied by violet boxed THE ROYAL NIGER COMPANY/CHARTERED LIMITED/POST OFFICE/ BURUTU handstamp. LONDON SW arrival b/s. 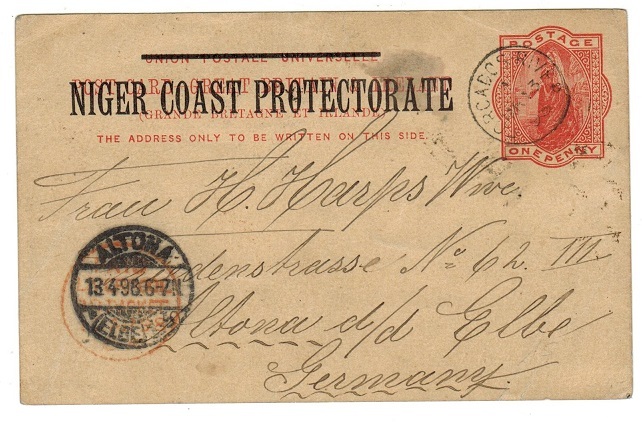 NIGER COAST - 1894 2 1/d rate cover to Germany used at CALABAR. 1894 (OC.4.) 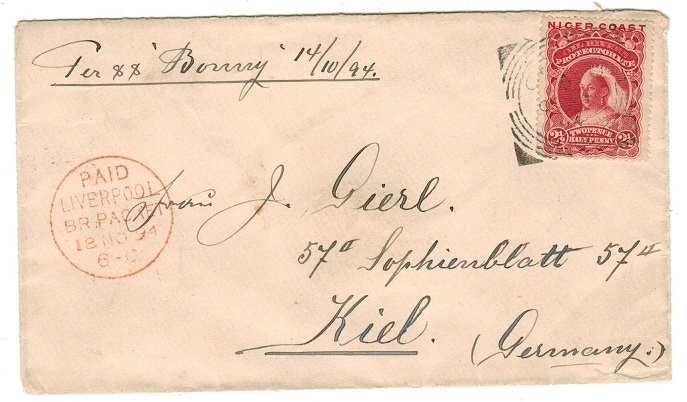 cover addressed to Germany headed 'Per S.S. Bonny' and bearing 2 1/2d carmine lake adhesive (SG 48) tied by light squared circle CALABAR cancel with red PAID/LIVERPOOL strike at left. KIEL arrival b.s. NIGER COAST - 1894 2d RPSE to UK uprated with 1/2d green (x4) adhesives used at BONNY. H&G 4A. 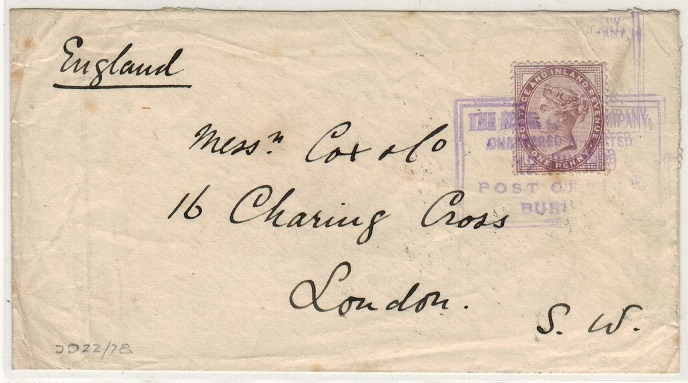 1894 2d ultramarine on cream registered postal stationery envelope (size G) addressed to UK bearing 1/2d green (x4) but with two having surface faults all tied by oval REGISTERED/BONNY cancels dated JY.8.99. H&G 4a. NIGER COAST - 1892 1/2d vermilion (SG 1) cancelled by scarce BUGUMA cds. 1892 1/2d vermilion (SG 1) cancelled by fine BUGUMA cds dated AP.27.94. NIGER COAST - 1892 1d PSC used locally from BRASS RIVER. H&G 2. 1892 1d vermilion on cream postal stationery postcard addressed locally to Brass (short message on reverse) cancelled by BRASS RIVER cds dated SP.9.95. 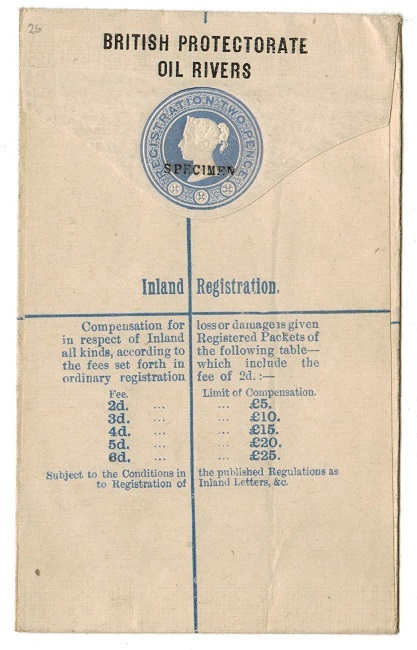 Addressed to a passenger on the S.S.Axim. H&G 2. NIGER COAST - 1895 1d PSC to Germany used at FORCADOS RIVER. H&G 3. 1895 1d vermilion on buff postal stationery postcard addressed to Germany cancelled by FORCADOS RIVER cds dated MR.13.98 with 'A' coding. H&G 3. NIGER COAST - 1893 2d RPSE used handstamped SPECIMEN. H&G 3a. 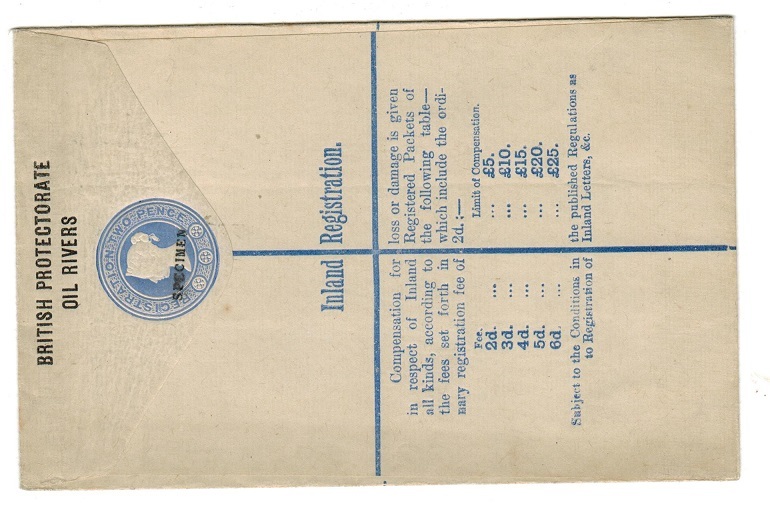 1893 2d ultramarine on cream registered postal stationery envelope of GB pre-printed BRITISH PROTECTORATE/OIL RIVERS on flap (size G) in fine unused condition and handstamped SPECIMEN in black and with the new rates for registration. H&G 3a. NIGER COAST - 1892 2d RPSE (size F) handstamped SPECIMEN. H&G 3. 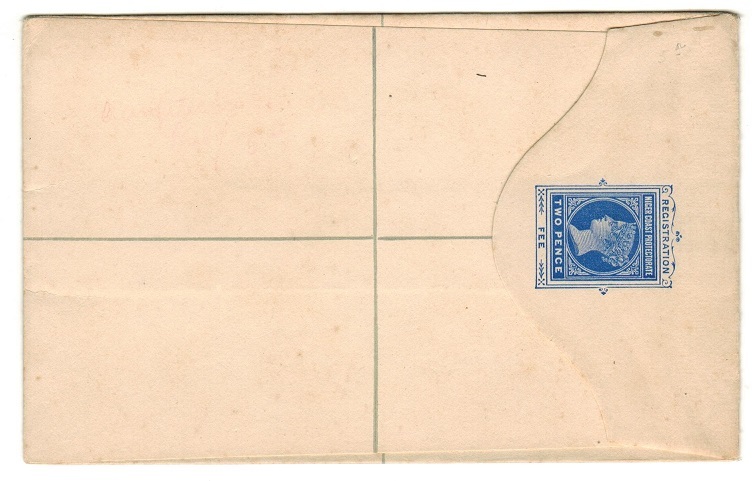 1892 2d ultramarine on cream registered postal stationery envelope (size F)in unused condition (shadow on reverse edge) showing rate compensation from £5 to £25 on reverse. 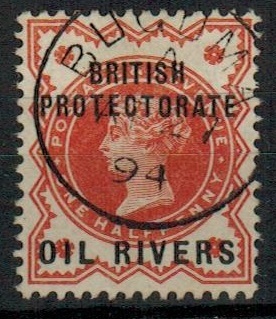 Overprinted BRITISH PROTECTORATE/OIL RIVERS. and handstamped SPECIMEN in black (Samuels type D8). H&G 2. 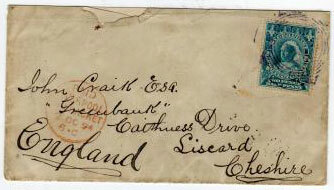 NIGER COAST - 1894 2 1/2d OLD CALABAR cover to UK. 1894 (AU.23.) 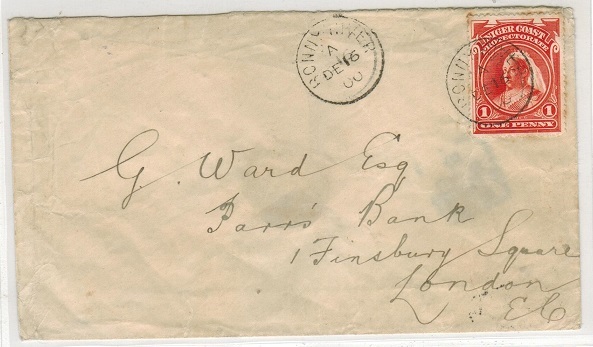 cover addressed to UK bearing 2 1/2d adhesive tied by squared circle OLD CALABAR cancel struck in violet ink with red PAID/LONDON/LIVERPOOL h/s at left.